Longtime visitors here will recall my association with the Hemingway-Pfeiffer Museum and Education Center located in Piggott, Arkansas. The Pfeiffer home is where Hemingway lived for a short time while married to Pauline Pfeiffer and where he wrote parts of A Farewell to Arms. I have a great affection for the place not just because they invite me there, but because it’s in Piggott, my second home of sorts. The museum holds three annual retreats. Writing retreats are different from writing conferences in that the object for the writers (most of them) is to get away and just write. At a conference, the writers play more of a student role and sit in on lectures and presentations. While there are fun writing exercises for the writers at the HPMEC retreats, the goal is to WRITE! My function as mentor is to lead them in the short exercises, provide feedback and comments to them on their writing, and to generally encourage them to get’er done! I very much enjoy reading the work and offering the encouraging feedback. Writing is work, yes, but it should also be fun! *Pictured: Bethany Mallett Stephens, Linda Wyss, Anne Winchester, Barbara Taylor, me (in all my bearded glory! ), Susan Hemingway, Ethan Baker, Doug Hemingway, Fay Guin. Yes, we did have a couple who shared Ernie’s last name and Doug even looked the part of Ernest! I’m not sure exactly when the retreats started, probably 2002, because 2008 was the 6th Annual. Initially they were weeklong summer retreats led by Dr. Rob Lamm from Arkansas State University. I learned about the retreat when I was editor of The Piggott Times in 2007. The very next year, 2008, one of the mentors couldn’t make it and they asked me to step in to to help out, which I gladly did!! The retreats had become so popular that they decided to begin an annual Fall retreat and I was asked to lead the first one. It was an abbreviated version (three days), but was no less packed with writing! In April of 2011, I was then asked to lead the first ever Spring retreat, a near-mirror image of the Fall version (meaning, it’s just a little shorter). During my association there, I’ve worked with three different directors, but it’s a testament to them and the staff there—who are fantastic!—that the retreats continue to grow and flourish. Last week, five of the nine retreating writers had never been to any of the retreats before (and I specifically mean the HPMEC retreats, not retreats in general…because I don’t know the answer to that). Writers come from all over, but mostly from the Arkansas, Oklahoma, Missouri, Kentucky, Mississippi, and Tennessee area. I understand there was a New York writer there this past fall. If you’re a writer and you’ve never been to a retreat, the Hemingway Writers Retreats are excellent ones to attend. They’d take great care of you and you can write where Hemingway did—maybe even channel some Hemingway in your writing. 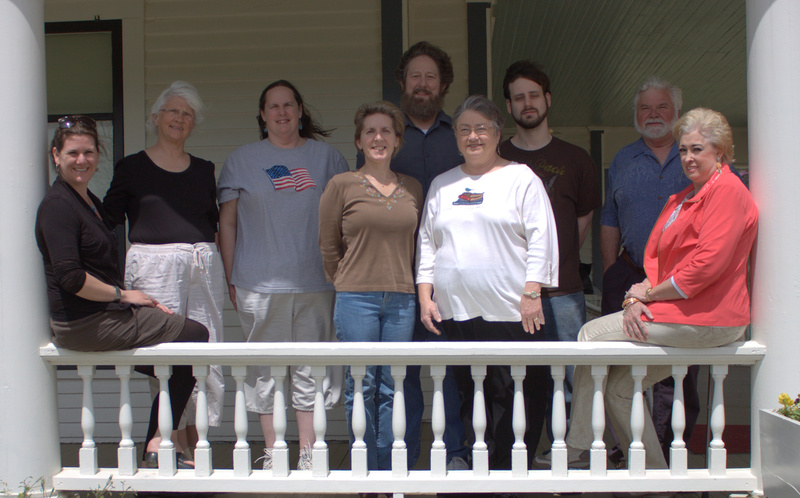 The Second annual Spring Creative Writers Retreat was held at the Hemingway-Pfeiffer Museum and Education Center in Piggott, Arkansas. Once again, I was honored to serve as the mentor/instructor. This marks my fifth year to be involved as a mentor/instructor. As always, it was an incredible experience. 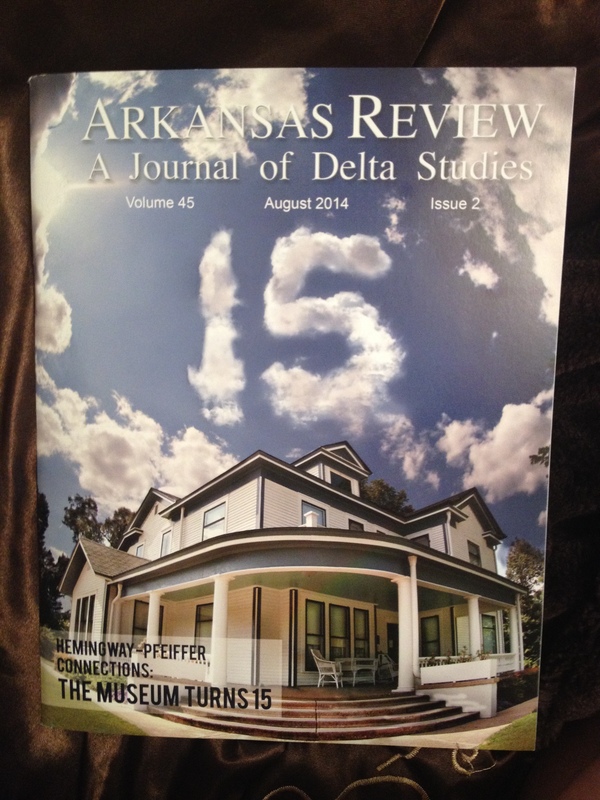 Some have asked how I got involved with a Writers Retreat in farming country Arkansas. Well, I’ll tell ya! When I moved to Piggott to become editor of the then Piggott Times, I worked hard to get to know the people I didn’t already know. Keep in mind, my family has been there for 150 years and has a long history there so I’m kin to about one-third of the folks there. I don’t remember exactly how it happened, but I know how I think it did: Deana Dismukes, who was then the Center’s administrator, had been delivering press releases to me. The summer of 2007, she asked me to come up and talk to the writers at the retreat. It was in the 5th or 6th year. She bribed me with lunch…and so I went. I did a story for the paper on the retreat and the writers there. Then, in 2008, after I’d moved to Oxpatch, Deana asked me to come be the assistant mentor for the week long summer session. It seemed the mentor who’d help get it all started, Dr. Rob Lamm, had responsibilities elsewhere and his assistant was stepping up. I gladly accepted! The retreats were so popular with the writers they demanded a Fall version. Thus, that November, a three-day Fall retreat saw its inaugural session with me as the only mentor. The others had regularly scheduled school responsibilities and I was available! The next year, 2009, the Fall retreat expanded to a weeklong event. Last year, 2011, writers demanded a Spring retreat. It was—and still is—a three day event. I’m honored to have been the only mentor at all of the Fall and Spring Retreats, and I love to see the continual flow of new writers coming to get some of Hemingway’s ambiance (he wrote parts of Farewell to Arms in the barn studio there on the grounds). Generally, I give the writers a mini-lecture followed by writing exercises both in the morning and then after lunch. Many of them come with projects they’re working on (like novels) and just want some time to get away and write! I know of about three novel s that have been at least partially finished—or at least worked on—while at the retreat. This year was no exception with a slightly smaller—but no less talented group. Pictured are: front (l-r) Dr. Adam Long – Associate Director for the Museum and Ed. Center, me, Mary Lou Moran; back (l-r), John Achor, Shannon Richards, Linda Wyss, Jane Gatewood, Jerry Davis. Not pictured are Anne Winchester and Brett Thielemier. If you’ve ever considered a retreat, let me encourage you to consider the Creative Writers Retreats at the Hemingway-Pfeiffer Museum and Education Center. I don’t think you’ll regret it. Tell’em Roland sent ya! Those of you who’ve been around this blog for at least 7 months know of the Hemingway-Pfeifer Museum and Education Center and the awesome writers retreats. I’ve just come away from another week of retreating writers in the small town of Piggott, Arkansas, where Hemingway penned portions of his famous Farewell to Arms. While I’ve known about the Pfeifer home and the museum for some time now, I wasn’t aware of the writers retreat until the summer of 2007 when the contacted me to do a story for the paper where I was editor. They fed me lunch, I listened for a bit, and did a story on it for the paper only to find out it was the first time the paper had ever even been there (I wasn’t editor there for the other retreats!). Needless to say, that shocked me, but one of the goals I had as editor was to make it more of a local paper, something it hadn’t really done before then. The next summer, 2008, I’d already moved on from the paper but kept in contact with a lot of the people there, and the kind folks at HPMEC contacted me about being one of the Writing Mentors there. I jumped on the opportunity. It must have gone well, because they invited me back to be the sole Mentor in 2009 partly because Dr. Rob Lamm, the regular summer Mentor, couldn’t make it that year. 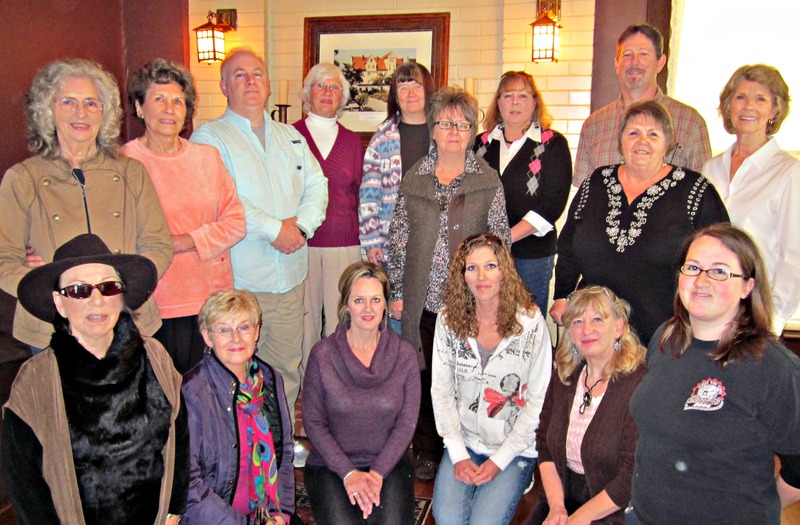 Interest in the retreat had been growing and they were looking for ways to enhance the experience for writers, so the now annual Fall Retreat was created and I became the Mentor for that. 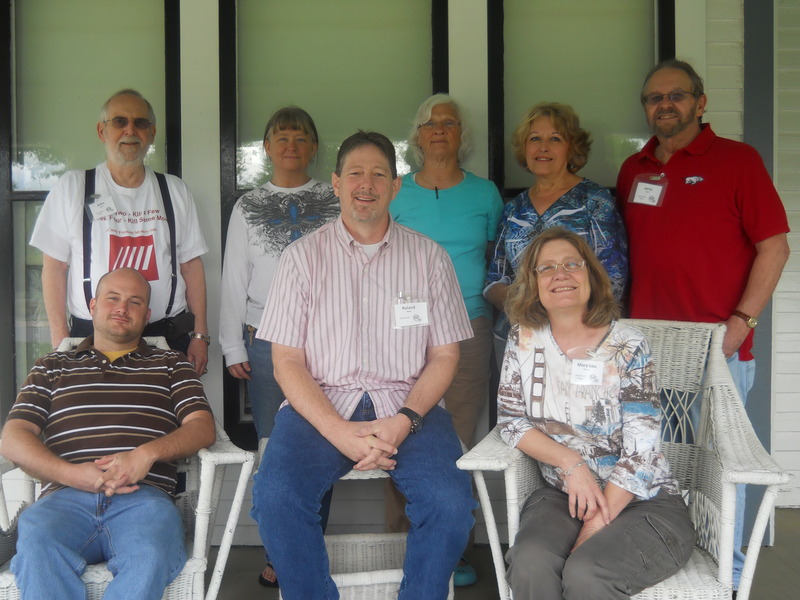 This past April they put on the first (and abbreviated) Spring retreat. As I’ve said before, writers should consider doing something like this—if not the HPMEC retreat. There were 14 writers in attendance this time, 10 of whom were first timers! Pictured are: front row, l-r: Brinda Gore, Dorothy Johnson, Cristy Phillips, Monica Moore, Teresa Lee, Kayla Dean; back row, l-r: Freeda Nichols, Elizabeth Foster, Richard Collum, Linda Wyss, Shannon Richards, Sue Whitmire, Barbara Collier, me, Evelyn Clark, Diana Sanders-HPMEC Assistant Director. As usual, the writers came from all over and had a wide variety of interests. It is the first time, however, that I’ve ever had one bring part of a working dissertation for comments! I am beginning to wonder, though… Two years ago Deana Dismukes, who was coordinating the retreats and putting together the anthologies, retired to many tearful writers and joyful grandchildren. At this retreat, Diana Sanders let us know she was about to retire and spend time with her grandchildren. A retirement party was thrown in her honor and her presence will be greatly missed. So I’m writing this particular entry because of this blog post. Not necessarily the post itself, which is just a review of an independent book, but the author’s response to that review. I wouldn’t necessarily say it’s gone viral (there’s a blog all in itself, huh? ), but it’s certainly making the rounds with small press and indy writers. Before I get off on that, though, I want to give a head’s up and a brief report. This week I’ll be leading the first ever SPRING edition of the Hemingway-Pfeiffer Writers Retreat to be held at the Hemingway-Pfeiffer Museum and Education Center (HPMEC). It’s not the first HPMEC Writers Retreat, but the first one in Spring. Why, you ask? Tis simple: the demand for such an awesome environment to escape from the rigors (and hassles) of everyday life and focus on writing is growing and growing. This is, of course, in tribute to the fantastic staff who host it and take such good care of the writers (and their mentor!). The schedule for this version is both condensed and expanded: meaning the days are longer but there are fewer days. My sessions at the Nashville Public Library system branches at Goodlettsville and Madison this past week seemed to go well. The librarians seemed happy when it was all said and done, and that’s important. Sara at the Madison branch suggested that the event was one of the better attended. The photos here are courtesy of her! I met some cool folks and talked about graphic novels/comic books. Hard to beat that! Okay, so back to the title topic. For those who didn’t go view the blog, I’ll recap. The site, Big Al’s Books and Pals, is a book review blog. Big Al accepts independently (self-published and small press publishers alike) published books to read and review. As with all reviews, authors aren’t guaranteed a “good” review. I’d love to submit my own book for more reviews, but the few I’ve tried I haven’t had much luck (though I’m hoping to get some reviews over at Goodreads—yes, I’ll keep you posted). So Big Al posts a review of this book (not gonna mention the book as I don’t want to drive hits to her!—you’ll see why). Says the story was compelling, but that the book was full of typos and the like and thus would make it hard for casual readers (ie, NON-reviewers) to actually finish the book. Wasn’t a glowing review and wasn’t a horrible condemnation. However, the author immediately begins to defend herself telling Big Al he read the wrong version (if I read it correctly, the version was SUPPLIED by the author!). She argues with others leaving comments, even swearing at them at one point. Many, many followed that up with an “I’ll never read your book no matter how good it is because you’re a jerk” kind of statement. Thing is, though, authors must know that the very nature of their work lends itself to criticism (“criticism,” as a reminder, is not inherently a negative word). It’s something they should prepare for. It’s something I even talk about sometimes in workshops or retreats—obviously partly because my job is often to extend criticism throughout. In a nutshell, I always say (and try to practice what I preach, as well) listen to all criticism—the good and the bad—and place it all into a big pot. Stir it up and learn from it. Some of the criticism an author receives will be well informed and on target. Some of the criticism an author receives will just be hot air. Regardless, it is someone’s opinion—and obviously someone who TOOK THE TIME to read that author’s work. So give them the courtesy of their opinion, thank them, and then ignore it if you wish. It really isn’t that hard to do.